Palace Resorts – the company that sets the standard in luxurious, all-inclusive resort accommodations – proudly announces the launch of a multimillion dollar enhancement project on the brand’s newest property, Moon Palace Jamaica Grande, the first Palace Resorts hotel located outside of Mexico. Palace Resorts assumed ownership of the Ocho Rios’ landmark property formerly known as Sunset Jamaica Grande on July 2014. Renovations and improvements being made include modernizing guest rooms, revamping and expanding meeting spaces, a redesign of the property’s façade and common areas, restaurant updates, the addition of amenities synonymous with the brand such as a FlowRider Double wave simulator, Wired Teens Lounge, ultra-chic Noir nightclub, expansive kids club dubbed “The Playroom” and much more. As part of the brand’s commitment to ensuring Moon Palace Jamaica Grande preserves its local Jamaican appeal, Palace Resorts has retained all of the original property’s core employees including longtime General Manager, Clifton Reader. The brand is investing in the property’s valued team by offering the opportunity to travel to headquarters in Mexico. In recent weeks, employees ranging from room attendants and supervisors to restaurant servers and reception executives have been immersing themselves in Palace Resorts’ culture, understanding the company’s core values, service standards and commitment to excellence. The employees have been undergoing concentrated training and familiarizing themselves with operational processes, while also participating in engaging and interactive team building activities. Furthermore, the Jamaica-based employees are sharing their own experiences and destination insight with the brand, in order to ensure the retention and celebration of the property’s local charm. “The entire Palace Resorts team has been eager to expand our awe-inclusive offerings, and Moon Palace Jamaica Grande marks the first step in taking the company to the next level as a major force within the industry. We are confident this new and exciting property will redefine Jamaica’s hospitality landscape,” said Gibran Chapur, Executive Vice President of Palace Resorts. 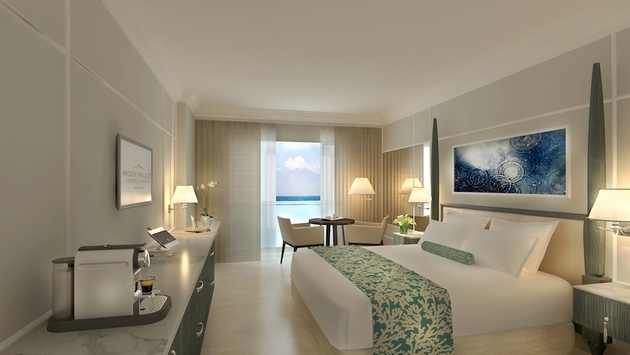 Situated alongside a striking, ivory white beach, upon its unveiling in early 2015, Moon Palace Jamaica Grande will house 25,000 square feet of multifunction meeting and event space. Additionally, Moon Palace Jamaica Grande will boast five dining destinations throughout the property, including a gourmet corridor and restaurants featuring eclectic flavors such as gourmet Asian, traditional Italian and modern Caribbean. As part of the multimillion-dollar enhancement project, cutting edge designer Francois Frossard is expected to elevate the property’s appeal with chic Caribbean décor and design reflective of the resort’s Jamaican setting. Lastly, upon completion, the property will also feature a stunning 35,000 square foot wellness sanctuary, complete with world-class Awe Spa and state-of-the-art gymnasium. Guests who book a stay of five nights or more will be privy to the most valuable vacation promotion on record – Palace Resorts’ ever popular $1,500 Resort Credit, which can be used on spa and beauty salon treatments, chef dinners, romantic dinners on the beach, wedding packages, and off-site excursions and tours such as dolphin swims, snorkeling tours, river tubing, Negril city tours, Waterfall excursions and much more. In addition to offering complimentary Wi-Fi and long distance calls to the United States, Canada and Mexico, Moon Palace Jamaica Grande guests will also be privy to round-trip transfers to and from the hotel and airport at no additional cost as part of the all-inclusive offer. Moon Palace Jamaica Grande’s all-inclusive accommodations start at $237 per person, per night, based on double occupancy. To reserve your Palace Resorts stay, please visit www.PalaceResorts.com, call (866) 424-4623 or contact your preferred travel professional.